Mercy Housing provides safe, affordable housing to families, seniors, veterans, people who have experienced homelessness, and people with special needs. Mercy Housing provides resident services designed to help with: health and wellness, out of school time, financial stability, housing stability, and community participation. 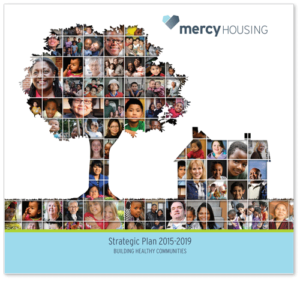 Given the many barriers that people with low incomes face, Mercy Housing’s 2015-2019 Strategic Plan emphasizes the expansion of service-enriched housing, a holistic approach to poverty alleviation that offers residents programs and services that improve the health of our communities. The federal minimum wage is $7.25. A full-time worker must make $18.92 an hour to be able to afford a two-bedroom rental home at market rent. Nationwide, the shortage of affordable housing is severe. For every 100 low-income households, only 31 units are available. 30% of people experiencing chronic homelessness have a serious mental illness, making it difficult to find and keep safe and affordable housing. 50,000 veterans are homeless in the United States. 46 million people live in poverty in the U.S., the highest number in almost 60 years. 2.5 million children are homeless in the U.S. That’s 1 in every 30 children. Provide housing for 20,000 more people. MERCY HOUSING PROVIDES STABILITY. The length of stay for a Mercy Housing family averages 5 years. RESIDENTS ARE ACCESSING HEALTHCARE. 51% of residents involved in our health and wellness services have health insurance, compared to only 25% who did not. SENIORS HAVE BETTER HEALTH OUTCOMES. Seniors that utilize our health and wellness services have fewer ER visits, have more medical checkups and are more likely to be insured. RESIDENTS ENGAGE AND GIVE BACK TO THE COMMUNITY. In our supportive housing properties, participation in community activities increased by 20% over three years.